Trying to budget for the cost of a replacement window project can be the difference maker for many homeowners. Most of the time people replace windows not because they want to, but because they have to. So naturally a lot of customers are looking for the cheapest solution. But when it comes to getting new windows, cheapest is never the best, and even a new window can be just a cosmetic solution. However, that is still fine for some folks looking for custom windows. What is more important is that you know what you’re spending your money on, and understand that with good window companies the difference in price also means the difference in efficiency. When it comes to window replacement, there are two main types of installation in Canada today. Full-frame installation: With a full-frame (tear-out) installation, your old window gets removed completely, down to the studs surrounding it. This allows the window installers to address any issues with moisture or rotting wood. Your custom window comes with new jambs, exterior brickmoulds, and interior trim. 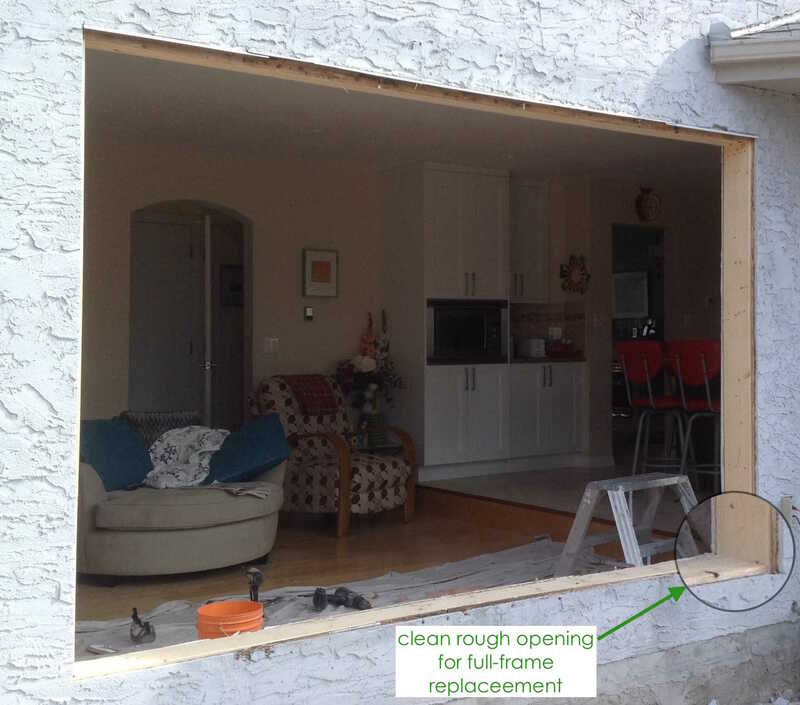 Retrofit installation: In a retrofit (insert) installation, new windows get inserted into your existing frames. The jambs also remain untouched. Aluminum capping is generally used on the outside to cover up rather than replace the existing brickmould. Retrofit installations are a much cheaper option than a full-frame replacement. A full-frame installation, however, is much more thorough and addresses all the issues with the windows themselves and the structure around it. It is very rare that an existing frame in old windows doesn’t have moisture damage around it. Therefore a tear-out is required with most windows, as a retrofit would not resolve these problems, but merely be a cosmetic fix. On average, full frame replacement costs 10-15% more than a retrofit installation. In a full-frame installation, the old window gets removed down to the studs. In a retrofit installation, new windows are inserted into your existing frames. Crank windows come in casement or awning style. These windows are operated by a crank mechanism and open away from the frame. An important feature of modern crank windows is that the operable part is surrounded by a compression seal. When these windows are closed, the compression seal makes an airtight unit and offers superior energy efficiency. A crank window with a compression seal. Sliding windows can either come in a hung, or horizontal slider. The operable part of these windows moves inside the frame and is operated by hand. Unlike crank windows, sliders usually have weather stripping at the point where the sash meets the frame. Weather stripping is not as efficient as a compression seal. A sliding window with weather stripping. As you may have guessed, crank windows are more expensive when compared to sliding windows. It is still possible to get comfortable levels of efficiency from sliders, but casement windows are considered to be the best-performing windows on the market. On average, crank windows cost 10-15% more than sliding windows. **Some companies still manufacture casement windows with weather stripping instead of a compression seal. If the price between these window styles is the same, chances are it’s because they use the same technology. Do you really need triple pane windows? In part, the answer depends on where you live. Canada is divided into three distinct climate zones. Windows have to have a certain energy rating (ER) to qualify for each zone. Triple pane windows generally have higher ER ratings than double pane, and, therefore, qualify for more areas in Canada. If you’re considering financing your project, you also may have to go the triple pane route. In Manitoba for example, the Hydro Home Energy Efficiency Loan approves financing only for triple pane units, as of this year. But even though double pane windows are generally less efficient, it is still possible to maximize their performance through the addition of optional features. The difference between a double and triple pane glass units. Advances in technology over the last several decades have allowed for additional features to be added to your windows, to improve their performance. Low-E coatings: Low-emissivity coatings significantly reduce heat loss from your home, and prevent Harmful UV rays from fading or damaging your interior. EnerEDGE Insulating Glass (IG) Spacer Used to join glass panes together into a unit, traditionally the spacer was made from aluminum or metal. Today, spacers are manufactured from a synthetic elastomer. These new spacers not only improve the efficiency of the insulated glass unit but also help reduce outside noise. Gas-fills: Most insulated glass units in vinyl windows are filled with gas rather than air. Gas fills further improve efficiency, reduce heat loss, and decrease condensation. Triple pane windows have an advantage because the extra pane can be used for more gas fill, resulting in even better performance. ETI Foam: Because their frames are hollow on the inside, vinyl windows can often be filled with Engineered Thermal Insulation to further reduce heat loss. If you are looking into getting custom windows, you often have the choice as to what kind of upgrades you want. A lot of companies also carry some of these upgrades in their standard window package. Be sure to ask about this during your quote appointment. At Ecoline Windows, all our windows come with a single Low-E coating, IG Spacer, and Argon gas fill. We also offer optional upgrades for additional Low-E coatings, ETI foam, Security glass. And those are just some functional upgrades. The cost of your window order also depends on aesthetic upgrades you choose. Window grills, privacy glass, custom trim, can all result in a higher price for your windows. Because of additional features that are necessary for ensuring efficiency in operable windows, some windows cost as much as 20% more than others. Ultimately this goes to demonstrate that there are a lot of options and decisions to be made as to what kind of replacement is right for you and is within your budget. Remember, it isn’t always possible to give a proper quote over the phone, as the existing condition of your windows plays a big role into what kind of replacement is right for your home. Find Out The Cost of Replacement Windows Overall rating: 4.9 out of 5 based on 41 reviews.